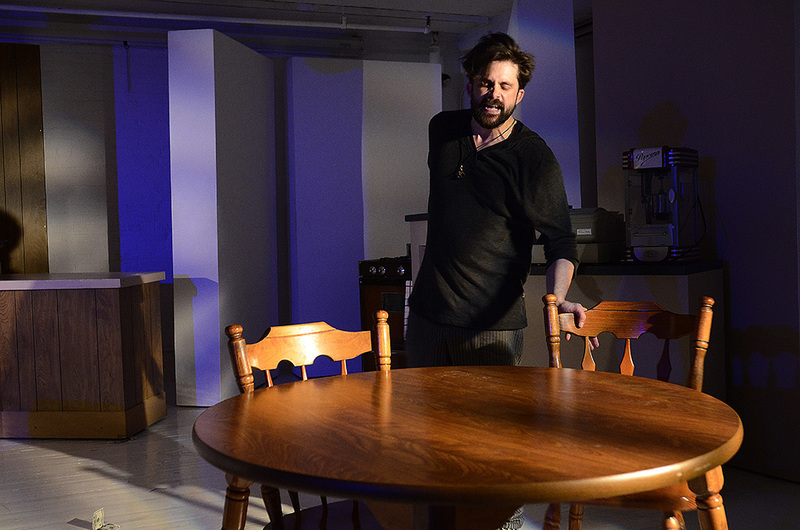 Boomerang Theatre Company presents the starkly substantial play The Reckless Season by Lauren Ferebee. Dominic D’Andrea directs. In the modern world, sometimes we must face a test and try to stand on our own. Some join the army. Some take drugs, or sell them. Some play video games to maintain some sense of order. This play dares to show us flawed, articulate characters on the verge of destroying themselves and each other. Terry (Trace Pope) works at a truck stop mini-mart and wants to contacts his brother, Simon (Chase Burnett), who is somewhere serving in the army. Their mother has just committed suicide and Terry has already made arrangements for the cremation when Simon suddenly returns home. They are not sure what to do after the cremation; supposedly the Grand Canyon is a popular spot for scattering ashes, but Terry isn’t sure if their mother would have wanted to be scattered there and is leery of walking on the ashes of so many dead people. Simon, who has seen his fellow soldiers blown up, does not have sufficient information to process his current situation. In the last few years, Terry has had nothing to do but play Spartan Glory (a war game Simon left him), try to connect with his troubled mother, and hang around Lisa (Amanda Tudor), who works other shifts at the truck stop. Lisa, who was a medic in Afghanistan, initially butts heads with Simon. Terry takes a large box of Almond Joy candy bars from his job; this box will be used to store his mother’s ashes. Terry and Simon receive a visit from a shady drug dealer named Flynn (Brian Morvant), who says he’s just checking on their mother. It turns out that said mother as well as many local veterans and Lisa’s soon-to-be ex-husband all use drugs to cope with life. Simon himself says that he doesn’t have PTSD, he just needs something to dull the nightmares. Flynn, a mostly self-serving person ostensibly not very knowledgeable about life (he thinks drug recovery is a 17-step program), theorizes that people take drugs because their loved ones don’t love them enough. After his usual spats with the local police, the meth-head husband overdoses and ends up in a coma. Lisa is eight months pregnant with her ex-husband’s baby when she finally accepts Simon’s offer to go out to eat. Simon is now a mall security guard and drinks heavily. Simon doesn’t know how Lisa can bring new life into this world. Lisa knows Simon is buying drugs from Flynn but can’t tell him to stop; it takes all that she has to keep herself from not using drugs again. Flynn has a transcendental vision and finally finds his places in the universe. Terry and Simon are headed to the Grand Canyon with their mother’s ashes when they get the call that Lisa has gone into labor. Which is stronger, the will to live or the will to die? These many revelations may be rough, but just remember, even mighty Sparta is a thing of the past. The ensemble is strong and Dominic D’Andrea’s directing in this play is a thing of beauty. Lauren Ferebee’s writing is both kind to everyone and no one; quite a feat. It really is wonderful to see onstage the people you may actually know—if not the gamer who never moved out of his parent’s house, then perhaps the veteran who left but had some obstacles to overcome upon his return. Scott Tedmon-Jones has designed a deceptively homey set; in the hallucinatory part of the play, it shifts around in ways more familiar to viewers of “Inception” and “Doctor Strange”. Steve Channon’s projection design includes those realistic war games which seem to be playing us. Kia Rogers’s lighting injects just the right amount of hope into this wonderfully honest and otherwise unfiltered world. Viviane Galloway’s costumes help address the important question: what does a drug dealer wear? David Anzuelo’s fight direction is needed, too, just like every drug dealer is in need of a beating. Andy Evan Cohen’s sound design nicely sets the mood for those characters who work the night shift of life.